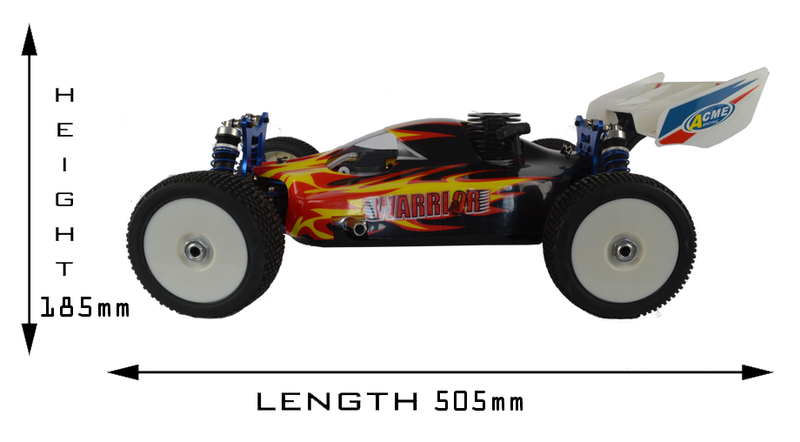 The Warrior is a fully built, fully featured, race ready, top of the range 1/8 nitro RC buggy. The many feature enhancements and highly adjustable setup make this great looking model not only look the part but 'be' the part! Features include a big powerful SH .21 engine, unique new c-hub steering system, steel gears throughout and 16mm big bore shocks. 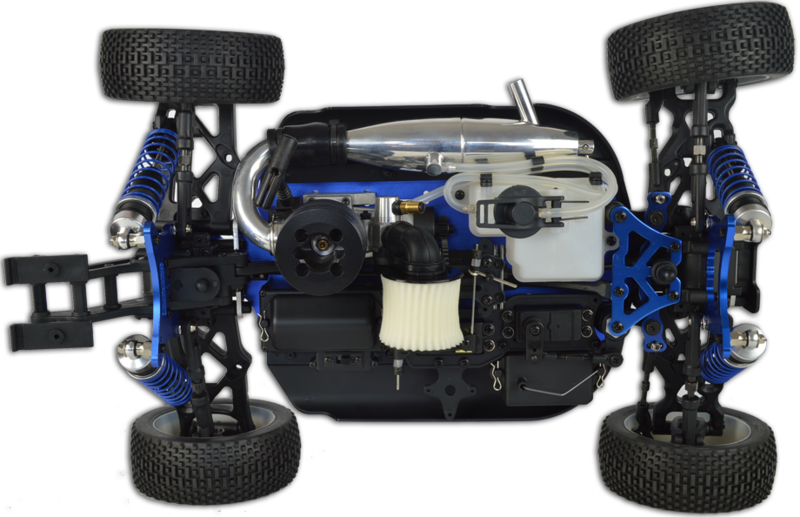 The ACME Warrior is a fully built, fully featured, race ready, top of the range 1/8 scale 4WD off-road buggy, and comes with many feature enhancements to make this great looking car not only look the part but 'be' the part! 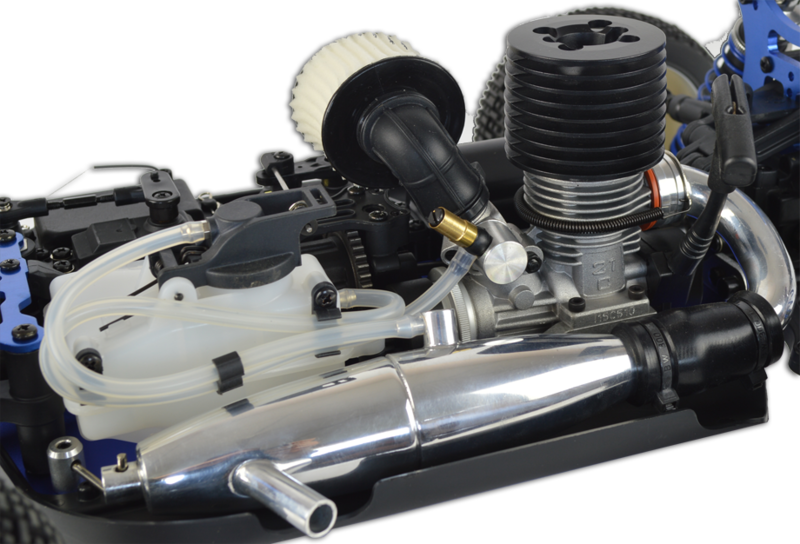 There are two versions available, standard or pro version and both have high quality components, and a powerful .21 nitro engine. The warrior is built using advanced components and innovative engineering to get the best performance out of your package. 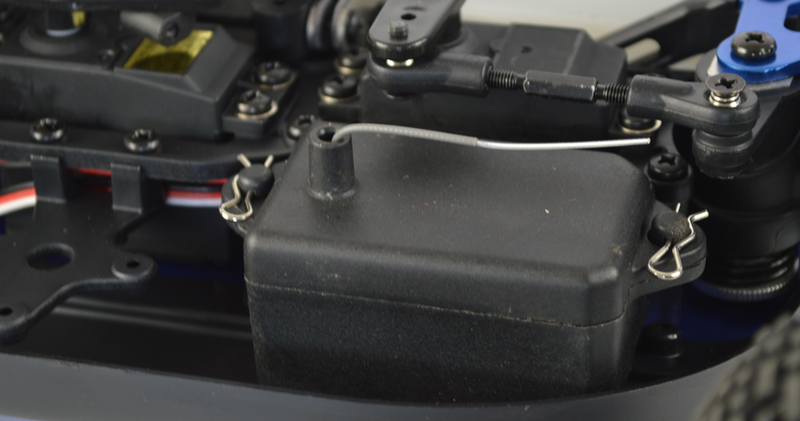 It has a newly developed C-hub steering system, where the king pin axis extends to the wheel centre (see picture above) which improves steering performance. It has a specially designed suspension system, this is fully adjustable which allows it to be set up for both on and off road driving. Part of its performance is due to the lightweight ultra-compact gear box; this has a low centre of gravity, assisting with grip and control. The gearbox is also built to be highly durable, so that it can cope better with the hard knocks associated with buggy use. It has been engineered with a gear ratio that offers both superb acceleration and a high top speed. Not only this but the gearbox consists of all steel gear and is of a pinion design which makes it easier to maintain and repair. The Warrior is built around a solid aluminium chassis, which has a width of only 129mm; this centralised chassis design allows quicker steering and faster response. The blows are cushioned by the 16mm super big bore oil shocks, pictured above. The Warrior also has an adjustable high-downforce wing for better traction and stability. 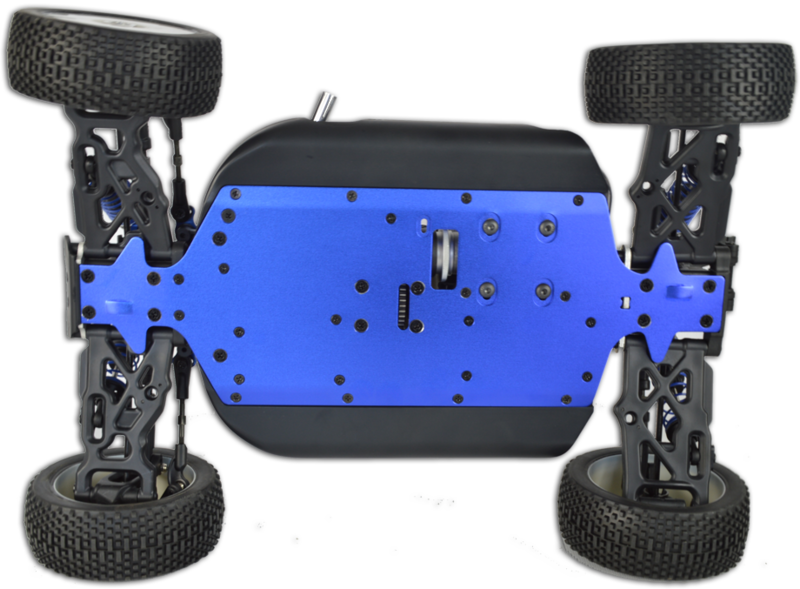 Additionally the front bumper is built so that it moves backwards on impact, this can prevent the chassis from becoming distorted or even broken when landing after jumps. The standard uses metal bearing. This model has 4 wheel drive giving better grip for better handling and off road ability. 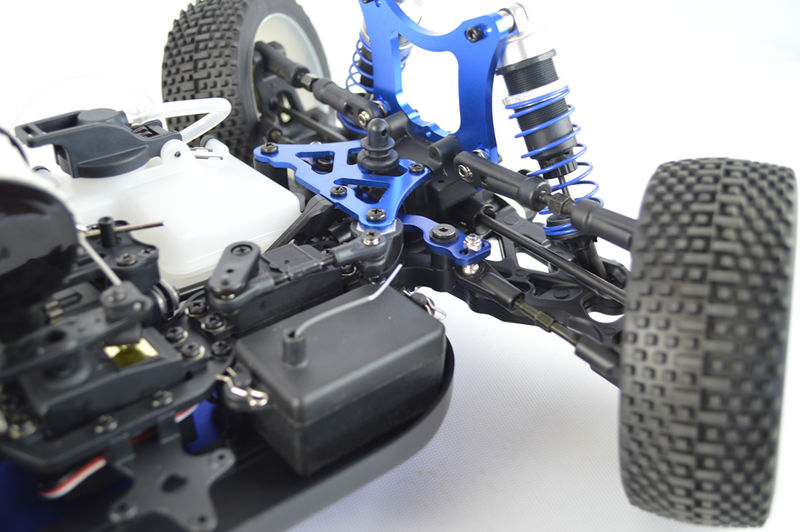 These hobby grade RC models also feature working front and rear differentials that further improves handling. As well as the front and rear differentials this pro model also features a third central differential gearbox to give the very best handling. All the gears have also been upgraded to steel. Splash-proof receiver is stored in a sealed box to further protect the electronics from splashes and rain. Thick anodised aluminium chassis with countersunk screws and splash guards. Advanced pro level steering system gives strong and quick turning response. The buggy measures 505mm x 185mm x 310mm (length, height, width). Both the angle and the tension of the big oil filled shocks is adjustable. The shock towers are aluminium so strong but light. 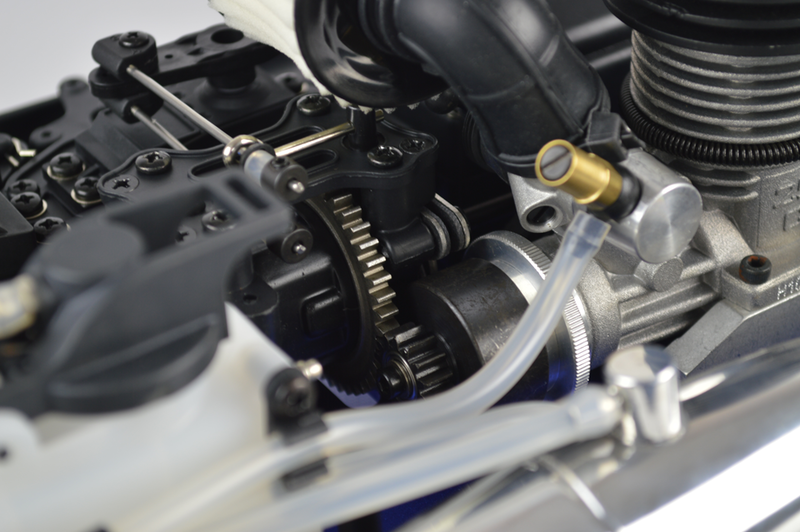 SH 21 engine made in Taiwan to ensure the highest quality connected to a tuned aluminium exhaust. 2.4GHz radio equipment allows multiple models to be used in the same area. 1 of the best cars at a very good price .